First Indication That All Was Not Well - Cracked Rib Or Return Of Cancer? 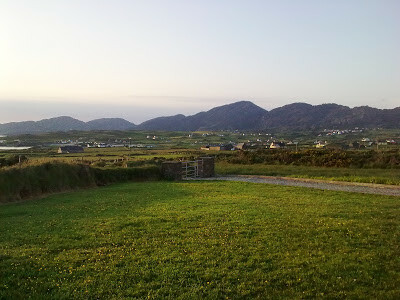 I look back to June of last year and remember how excited hubby and I were at the prospect of living for a whole year in our favourite part of Ireland, Allihies in the Beara Peninsula, West Cork, with many return visits to family and friends in Dublin, of course. After all, we would be spending a lot of time with our son and beautiful daughter-in-law before and after the birth of their first-born. We would become grandparents in August. Everything was set for the adventure of a lifetime, even the lambs in the nearby field seemed to share our joy. 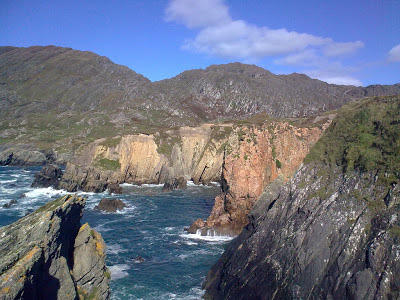 Every day for the first three weeks we did as we always did in Allihies - went for two hour long walks across the rugged landscape and along the Ballydonegan shoreline. One morning, on waking, I felt a fairly sharpish pain at the base of my right rib cage, definitely nothing to concern myself with, most likely a strain from all those rocky hills and climbing over the odd gate! As time went by, the pain only presented itself every other day, definitely nothing to worry about. Then, on the morning of Friday, June 28th, in considerable discomfort the thought flashed through my mind that this could possibly be the Breast Cancer spreading but immediately dismissed the idea, opting instead for a self-diagnosis of a cracked rib. Later that morning we decided that if the pain got any worse we'd head home on Sunday and have it checked out. Saturday came and things weren't too bad, even had a G&T that night while watching the Rolling Stones strut their stuff at Glastonbury. In the early hours of Sunday morning when trying to turn over in bed, it was so painful that I remained in the same position until finally waking at around 7.30am. The decision to head home was made when, even with the help of hubby, I screamed with every tiny movement as I tried to get out of bed. The five hour car journey was an absolute nightmare. Next day I would visit our GP. 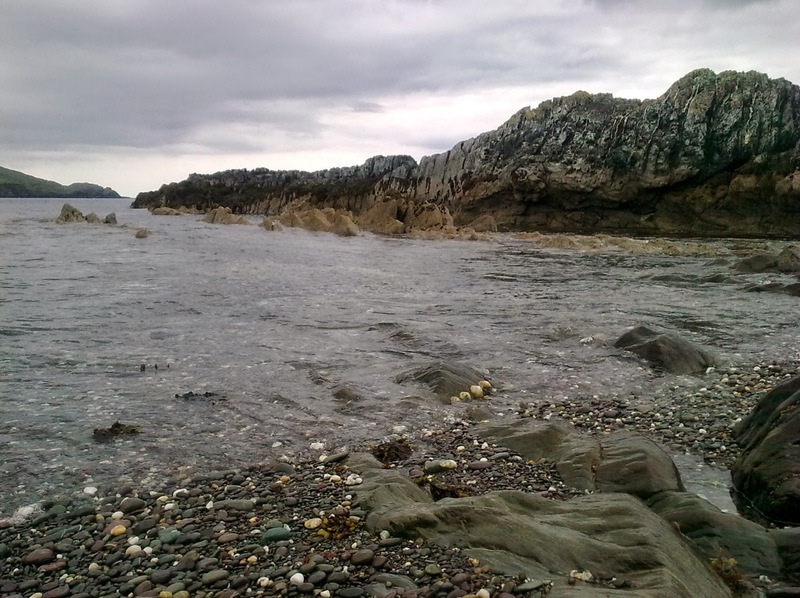 Above image: Ballydonegan Bay, Allihies, taken by me, June 2013. My mother would always say "man proposes and God disposes" meaning, we make the plans but God decides the actions. 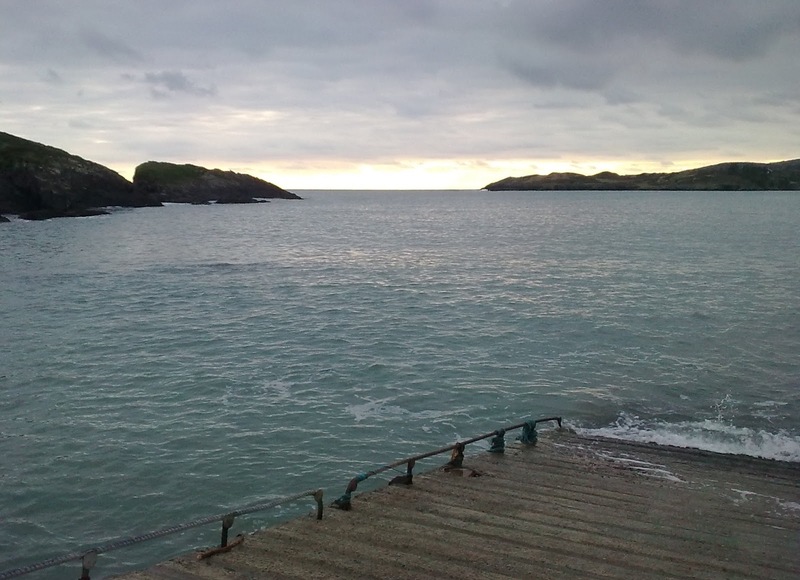 Never has that been so true when, in June of last year, hubby and I made the life-changing decision to spend a large amount of our retirement years renting in Allihies, West Cork. As I mentioned many times before, we fell head over heels in love with this amazing little village the first time we visited back in 2001. 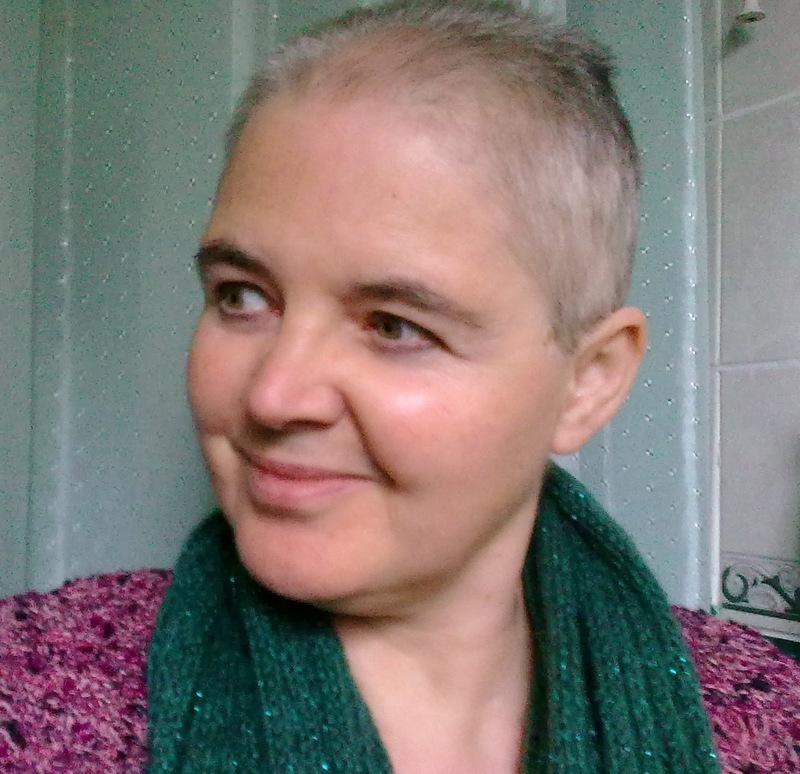 Nothing could have prepared us for the bombshell that was to hit four weeks later - my breast cancer had spread to my rib-cage and spinal vertebrae, from neck to base of spine. Having moved from our lovely rented bungalow in Skibbereen at the end of May to our gorgeous, proposed rental home in Allihies we decided that we'd like nothing more than rent this house for one whole year. I had so many dreams of having our family, including our first grandchild, and friends come visit us for long weekends, we of course, travelling back to Dublin every so often to visit them. This visit, would also for me, definitely include a spot of retail therapy! Well, that's how these things go. 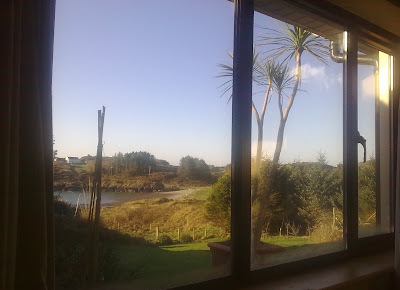 We're hoping my treatment will finish at the end of March and who knows, maybe this summer we may well return to Allihies for a couple of weeks, God knows, my hubby is in dire need of a holiday. Just before I entered hospital at the end of August last year our beautiful grandson was born. This little boy will never know how much he has contributed to my great improvement as shown by my MRI and CT scan in December. The love of my whole family, especially my beloved hubby and the constant contact and great love shown by our good friends has helped enormously in getting me through some really tough times, I can't begin to thank you all. Above image of me taken September 2013. Return To Allihies - Latest Wanderings! To continue from where I left off last time, hubby and I have left Skibbereen where we spent a wonderful four months and have now moved into our lovely rented house in Allihies in the Beara Peninsula, West Cork. 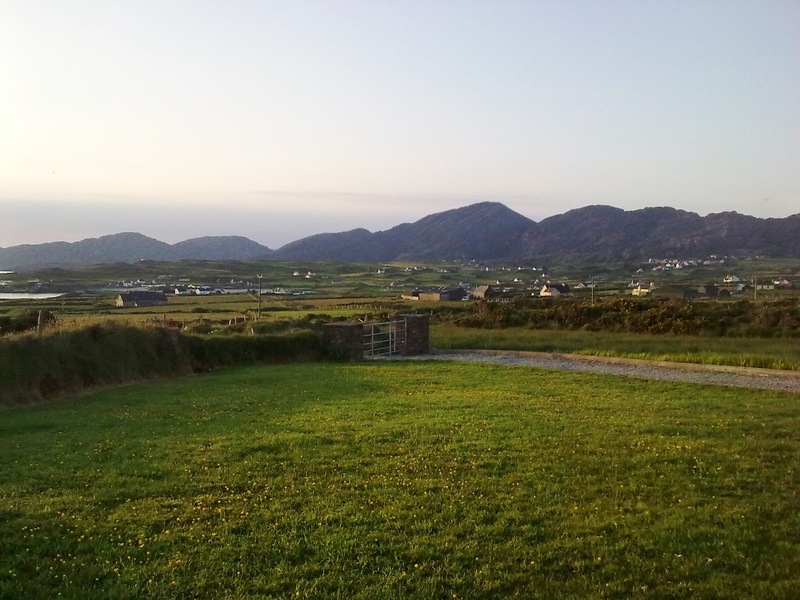 I've probably declared this many times but since our first visit to Allihies twelve years ago, it's been drawing us back time after time to the point where we now know this is where we want to live out a good deal of our retirement years. Our plan is to divide our time between West Cork and Dublin, probably spending a fair amount of time over the coming months with the family in Dublin because as I mentioned in the earlier post, we are to become grandparents in August. Each day here brings its own beauty - early morning thick mists wholly enveloping land and sea, horizontal rain with gale force winds and sunshine that casts a golden glow across the fields, coaxing the foxglove and fuchsia flowers into full bloom - all that sometimes in one day! Rarely are two hours the same. Since we arrived here three weeks ago we've been walking the bohreens and back roads to Allihies village almost on a daily basis and when the swirling West Cork winds permit, we cross the rugged Ballydonegan landscape. For what seems like miles we walk along the cliff edge, where, far below, blue-black waters weave and crash their way between the dark, mountainous rocks. I find it terrifying and exhilarating at the same time. The first thing I noticed when we arrived back down here after a two year break is that everywhere seems the same, nothing has changed, for that I am so grateful. Not a property developer in sight! 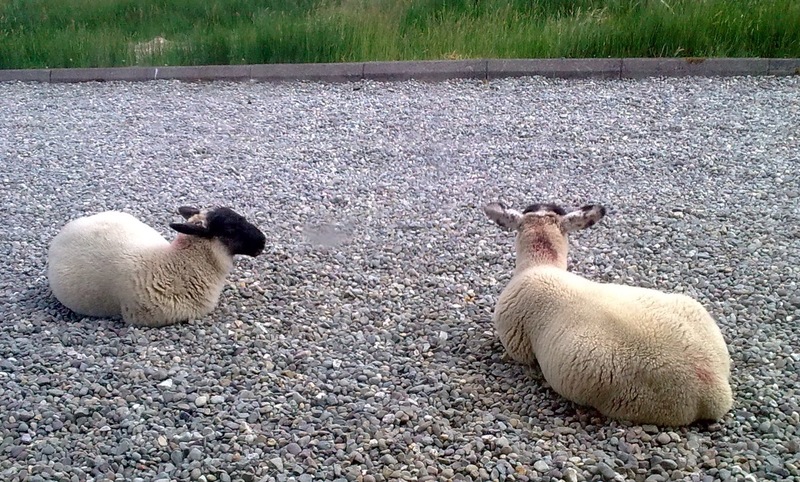 Over the weeks we have made new friends, these two little guys find shelter from the winds just outside my writing room window, usually early in the morning and on warm sunny days, they relax on the lawn with their mother. They're so used to us now that if we come out they just glance up then continue chewing the cud! 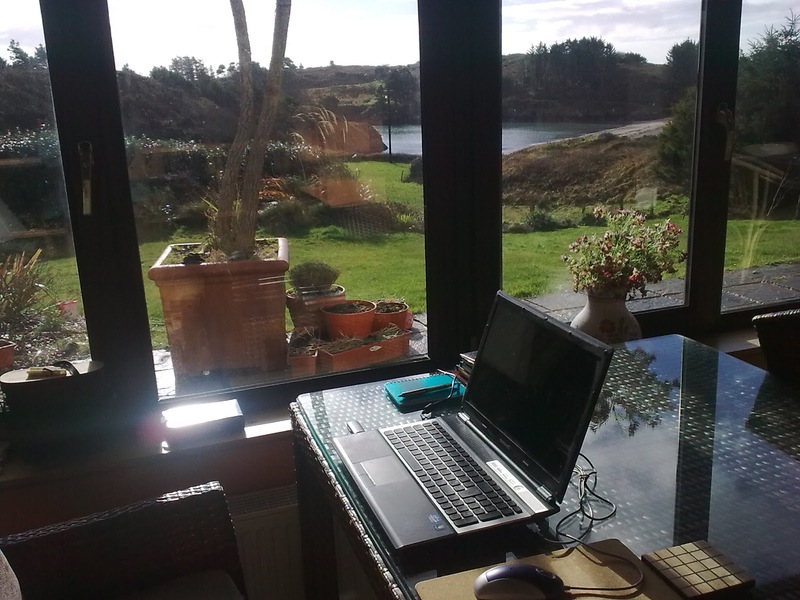 I plan to write regular updates on life in our little haven in Allihies. All images taken by me, June 2013. I'm not quite sure where you'd need to have been hiding for the past few months not to realise that, at this very moment, Ireland is in the midst of commemorating President John F. Kennedy's 50th anniversary visit to these green shores. Although Dublin, Cork and Limerick were honoured with his visit it was his "homecoming" to (The Kennedy Homestead) Dunganstown, New Ross in County Wexford which drew the greatest media attention and indeed, the massive outpourings of "Cead Mile Failte" from family and locals alike. It was from this place in 1848 that the President's great-grandfather, Patrick Kennedy, left for the United States along with the many other emigrants aboard the Dunbrody Famine Ship. I was exactly eleven and a half years old on that evening in June 1963 as the presidential cavalcade moved slowly along Westmoreland Street, Dublin. Standing tall and tanned in the open-top car was the President of the United States, JFK, as he was affectionately known to one and all. Deciding I wanted a good view of this exciting person who had traveled from a far off land (well, actually Germany that morning) to be with us I gradually inched my way out to the front of the crowd, my mother within grabbing distance behind me. I'm not quite sure if it was his brown skin (I'd never seen anyone with a tan before! ), dazzling smile or his amazing presence, probably all three I suspect but I went weak at the knees when he passed by. I'm even certain he made eye contact with me as he waved, well, I live in hope! As we didn't have a telly until a little later on, mother and myself would head over to our neighbour across the street to view on her Bush or Pye 17" box all the comings and goings of the President as he traveled around the country giving, what became, his historic speeches. Yes, for me, the summer of '63 was a good one. 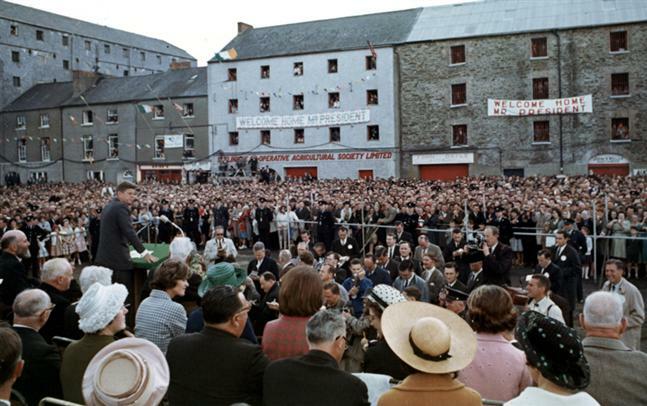 Above image: President John F. Kennedy in New Ross, County Wexford, 27th June 1963 via Wiki. They say time flies when you're enjoying yourself and this has certainly been the case during our two months down here in beautiful Drishanemore, Skibbereen, West Cork. Daily, I'm drawn in by the breathtaking surroundings which could be mistaken for any one of the many exotic locations around the world. Rain or shine, the view, from the left side of the house, mesmerises me. 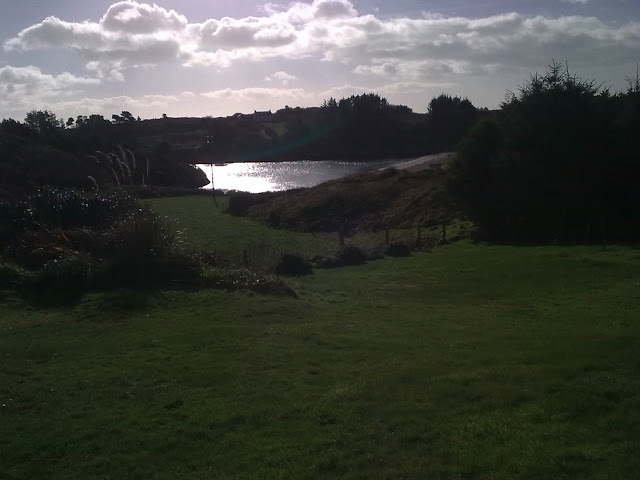 Just looking out over the sloping lawn which merges into the small field below then across the narrow gravel road that leads you straight to the water's edge of the magical cove, takes me into a kind of hypnotic trance. I know that when we finally leave here I shall miss this place with all my heart. 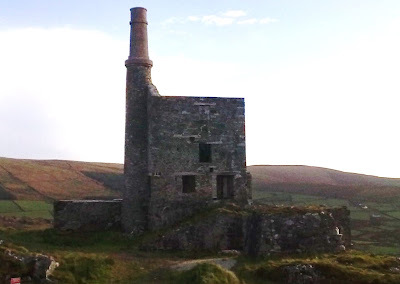 Nearly three years ago when hubby and I returned to Allihies in the Beara Peninsula (a two hour car journey from Drishanemore) after first visiting with our children back in 2000, I never realised the impact that this small village, with the old mine engine house as its landmark, would have on our lives. It's to there we returned a couple of times during these last two months and it's where we will eventually spend a considerable amount of time over the coming years. For the immediate future, however, we have very good reason to be in Dublin as much as possible - in late summer, we are to become grandparents! Top image: View from bedroom, Drishanemore, taken by me, March 2013. Bottom image: "Man Engine House" Mountain Mine, Allihies, taken by me, October 2010. As it was a lovely evening last Sunday plus after watching Ireland's disastrous defeat to Scotland in the Six Nations Championship at Murrayfield it was time to hit our local, The Skibbereen Eagle, in Tragumna. Our first time there and only a twenty minute walk, well, for me, anyway. Nice pub and with its warm, welcoming wood-burning fire I thought it would be packed, but no, just a couple of families with their young children and another older couple at the other end of the bar. By the time we emerged an hour later the sun was setting over Tragumna, which of course created magnificant lighting. 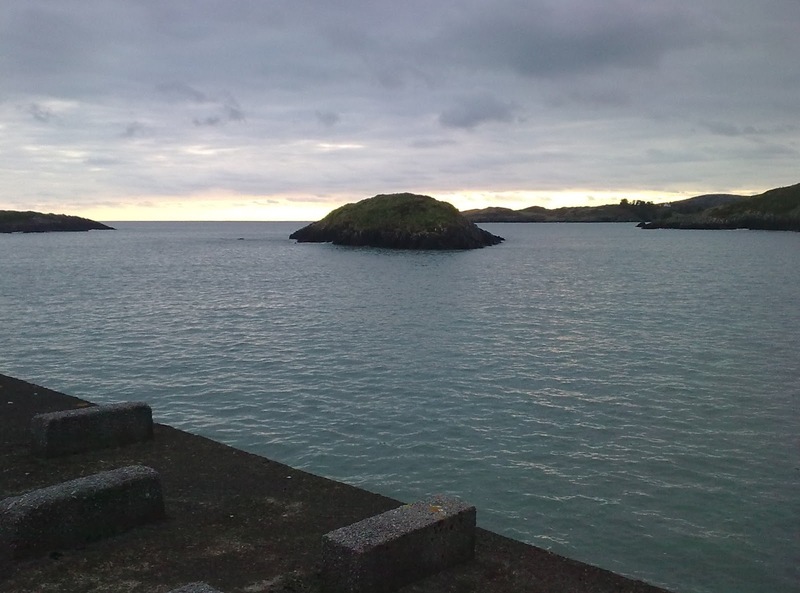 The views over Drishane Island and the Tragumna pier are particularly beautiful at that time of evening. Monday afternoon saw us head to Lough Hyne, Ireland's first Nature Reserve with splended woodland walks towering ever so high. With encouragement from hubby I did manage to climb up onto the first layer, if you like, and was generously rewarded by the breathtaking views down onto the lake and roadside. I loved every minute. Later that evening we learned that there would be a full moon so at around 10.30pm I got hubby to accompany me to our little cove where we just stood and listened to the waves and watched in awe, the amazing moonshine turn the water to silver. It's a memory that will remain with me forever. 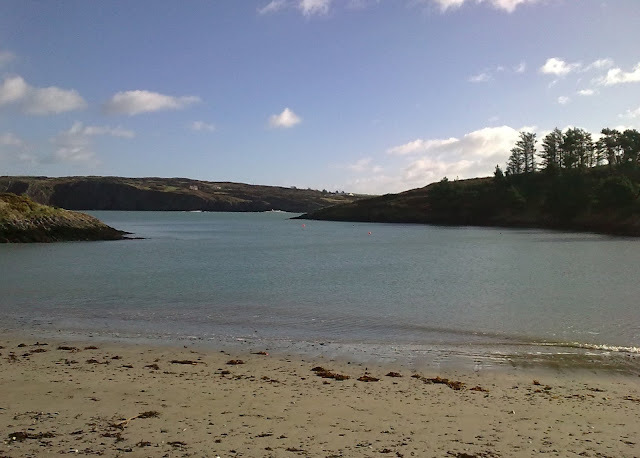 Drishane Island, Tragumna, Skibbereen, West Cork. 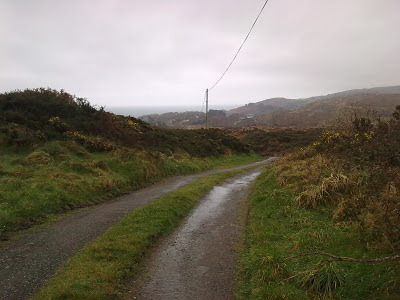 Scenic walkway along Lough Hyne. All images taken by me, February 2013. I can't believe hubby and I have been three weeks here already! The house we're staying in is everything I've always wanted - on a hill, overlooking a cove. The fact that there's a boathouse in the huge garden really conjures up, for me, images of Enid Blyton's "Famous Five" not to mention the cove at the end of the long garden which for some reason constantly reminds me of Daphne du Maurier's "Rebecca". We even have the iron gate leading to the drive. The area is Drishanemore, Skibbereen in West Cork and as yet there are many places of great interest we haven't visited but plan to do so in the coming months. Overall, the weather has been fairly good, through there have been a few days of continuous rain and it definitely has been very cold in recent days but in general, we've managed to get out for our walks almost every day. As I always say, a grey sky has its own beauty. With the house being a family home I'd rather not show internal images for privacy reasons, much as I'd love to, but the beautiful external views can certainly be enjoyed. Boreen not far from house. Cove 100 yards from house. View from my writing desk. "Need A Laugh? - French Holiday Diary Extracts"
I'm an actor who enjoys writing when the words present themselves. I also enjoy reading, taking photographs of people and places I love and generally enjoying life.